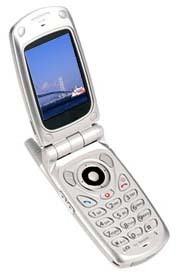 The Sharp GX22 is a color flip phone with a built-in camera. That description hardly does this phone justice, since in reality it makes most of the other color phones look like cheap toys. I would like to thank Carsmovies for showing me his Sharp GX22. What is it about the GX22 that makes it stand out from the others? The simple answer is the screen. If you like color screens, you will absolutely go gaga over this one. It is, without a doubt, the best color display of any phone I have thus far experienced. The screen has a whopping 320 by 240 pixel resolution, and it can display 262,144 colors. The color clarity and brightness is as good as what you might expect from a quality LCD computer monitor. In fact, I suspect that the dot density is much higher on this screen than on your average LCD monitor. Comparing this screen to a lesser one (such as the Motorola T731, which I happened to have with me at the time) is enough to make you cry. The lesser screen looks so bad by comparison that you see it for the cheap toy that it is. Once you experience the quality of the screen on this phone, you will be spoiled for anything else. The 640 x 480 camera that is built into this phone is also amongst the best I have seen. It handles varying light conditions with aplomb, unlike most other camera phones that produce washed-out pictures in anything but the best of lighting conditions. It even works superbly in low light, but it also comes with a super-bright, multi-colored LED for illuminating close objects. The LED can be set to green, red, blue, white, yellow, or orange, depending upon what sort of lighting effects you desire, and it has a redeye reduction feature. Carsmovies promised to try and download the pictures we took, and once he sends them to me I will attach them to this review. The camera is also capable of taking mini-movies, but don’t expect too much from these. The resolution is decidedly lower than the still camera, and the number of frames per second is a bit low. Just the same, if you need a movie in a pinch (with sound apparently), the GX22 can certainly do the trick. Now most you know me better than that, and you know I wouldn’t gush over a phone unless it had the goods where it counted. I’ll get to the RF performance and audio quality in just a minute, but suffice it to say that the phone holds up very well in these categories, even if those features doesn’t awe you like the display. The menus are extremely well laid-out, and good use is made of the screen’s enormous real estate. The only aspect of the menus I found somewhat disconcerting was the slightly slow response of the keys when they were hit in quick succession. Those menus include many of the goodies we’ve come to expect in modern high end phones. However, the GX22 doesn’t have expandable memory or a computer-like operation system as we find in the Nokia 3650. The phone could do so much more, especially with the killer screen, and for about $800 (Canadian) it isn’t a cheap proposition. I’m happy to report that while the GX22 isn’t about to de-throne the Nokia 6310i for RF and audio, it does hold its own very well. In fact, in one particular aspect (namely outgoing sound quality), it is easily the best I’ve ever heard. The outgoing quality is well-balanced, and it handles background better than any other phones I’ve tested. The incoming audio doesn’t quite reach those lofty heights however. The reproduction and tonal balance are very good, but the earpiece seems to lack the necessary low-end needed to give it that richness that make the Nokia 6310i and 3650 sound so good. Earpiece volume is more than acceptable, but it could do with being just a tad louder. RF performance also falls slightly short of the 6310i, but in the final analysis it didn’t miss by all that much. I could drag calls further down the Hall of Shame in Square One with my Nokia than with the Sharp, but the distance wasn’t great enough to declare the Sharp an RF light-weight (like the Ericsson T600 and T68i for example). In the end I couldn’t help be impressed with this phone. I do admit that the screen and camera quality were big factors in this, since the lack of low-end on incoming audio does disappoint me. I guess it’s the lack of really negative things (aside from incoming audio) that impresses me the most. I don’t see myself buying one in the near future, but I can certainly see myself recommending it to anyone who wants a top-notch camera phone.